A policeman holds a rifle at location where a suspected supporter of Islamic State attacked policemen in Tangerang, Indonesia's Banten province (October 20, 2016). As Islamic State (ISIS) loses territory in its base, northern Iraq and eastern Syria, fresh concerns about returning foreign fighters have mounted in Southeast Asia. In December 2015, the Soufan Group estimated that some 900 Southeast Asian fighters, with a majority from Indonesia, had traveled to Syria and Iraq to join the fight. Official estimates from Southeast Asian intelligence agencies placed the number between 1,200-1,800. While it is difficult to estimate precisely how many fighters from the region are currently participating, the Straits Times reported most recently that some 392 Indonesians are believed to be fighting for ISIS in Syria. Malaysians have also been seen in ISIS videos, but they are believed to constitute a distinct second to Indonesian fighters. However, not all Southeast Asian who have traveled to ISIS-controlled territory are fighters. It appears that some 45 percent of the numbers estimated are women and children who have accompanied the men fighting in the Levant. Estimates also include those who have gone to fight alongside other rebel groups, including Jabhat-al-Nusra. Since July 2014, ISIS has used social media, propaganda, and recruitment videos released by its media wing, Al-Hayat Media Center, to persuade Indonesians, Filipinos, and Malaysians to travel and join the group. While ISIS does not pose a distinct threat in the Southeast Asian region currently, the sheer number of Indonesians and Malay-speaking foreign fighters has been enough to form its own fighting unit in Syria, known as Katibah Nusantara. Formalized in September 2014, through a series of bayat (pledge of allegiance), Katibah actively recruits in the region, provides a social platform for recruits looking to settle in and connect with other ISIS members, as well as tutorials for logistical and tactical training. Public opinion polls conducted by the Pew Research Center reveal that support for ISIS is difficult to find in Indonesia; 79 percent hold an unfavorable view of the group compared to only 4 percent who view it favorably. Close to 50 Indonesians have since returned to their country, citing disillusionment with the extremist group. An additional 200 people, 60 percent of whom are women and children, have been deported from the Turkish border before reaching their destinations in Syria or Iraq. Terrorist attacks are not new in Indonesia. Following the 9/11 attacks, terror threat alerts rose in many parts of the world. Jemaah Islamiya (JI), an al-Qaeda linked terrorist group, and its splinter organizations have carried out a range of bombings and attacks throughout the region. The most notable incidents in Indonesia include the 2002 Bali bombings that killed 202 people (including scores of foreigners); the 2003 J.W Marriott hotel bombings in Jakarta that killed 12 people; a car bombing outside the Australian Embassy in Jakarta, claiming the lives of 10 Indonesians; further bombings in Bali in 2005 killing 26 people; and the 2009 bombings of the Marriott and Ritz-Carlton Hotel in Jakarta, killing at least nine people. The most recent attack occurred in January 2016, when multiple explosions near the Sarinah shopping mall and a UN information center rocked Jakarta, killing eight people and injuring many more. The attack was the first to be claimed by ISIS. Currently there exists no formal ISIS presence in Southeast Asia and there is little to suggest a significant ISIS threat to the region. However, given the history and presence of militancy in the region, existing jihadi groups such as the Mujahideen Indonesia Timur (MIT) in Indonesia and the Abu Sayyaf Group in the Phillippines have pledged allegiance to ISIS, raising concerns regarding the formation of a formal ISIS affiliate. In Indonesia, JI too had pledged allegiance to the group in July 2014 before rescinding it. While JI, a U.S and UN designated terrorist organization, may serve as a re-emerging threat due to its established support base, it theologically differs from ISIS on a multitude of fundamental issues. As ISIS loses ground in consolidated territory there are growing fears that the group will lash out overseas, encouraging ISIS-inspired “lone wolf” attacks. There is also mounting concern that Indonesian fighters will return home equipped with the training and combat experience, harnessed further by staunch ideological beliefs. The term “returnees” encompasses different categories: returning fighters as well as women and children who have accompanied fighters, minors, non-combatants, and more. Globally, the question of how to deal with returnees falls upon two central issues: (1) the problem of evidence, i.e. how to prove someone was involved in violence (when it is not explicitly known) and the permissibility of internet based evidence; (2) lack of capacity of states to conduct rehabilitation and reintegration. In the Indonesian case, most known returnees constitute those who have not managed to gain entry into Syria, and thus are lacking in training and experience. These “returnees” may then actually be classified as “deportees” and should not be included in the returnees count. The distinction is critical to make. As Joseph Chinyong Liow, a fellow at Brookings Institution notes, in assessing the threat level efforts have been made to draw parallels between those who returned to the region following the Afghan jihad in the 1980s and those possibly returning after fighting in the Levant. This particular point requires greater understanding of the context of political and historical movements in Indonesia. Most fighters who participated in the Afghan War had traveled to gain combat experience to then return to Indonesia and overthrow the repressive regime of President Suharto. However, a post-Suharto Indonesia, which has seen successive governments fortify democracy, fails to provide an environment requiring the urgent utilization of such skills. Finally, there is also a belief that those who are deeply embedded in the fighting in the Levant may instead choose to finish the fight in what they see as the “great end-times battle,” drawing deeper into their ideological training instead of returning home. While much has been said about returning fighters and lone wolf attacks in Western Europe as well as in the Middle East, the phenomenon is somewhat different in Southeast Asia. Improved counterterrorism measures across the region have greatly aided in keeping any major terrorist attack at bay. Growing divisions and rivalry between militant groups have also helped to prevent cohesive and coordinated attacks, while law enforcement capabilities have been honed further. Detachment 88 (also known as the National Police Counterterrorism Squad) and the National Counterterrorism Agency have both arrested a number of ISIS sympathizers throughout the country. 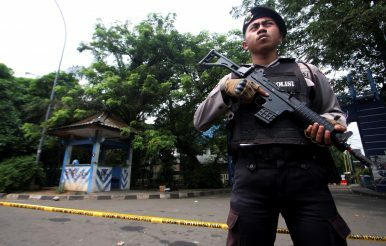 Late last year, National Police Chief Tito Karnavian announced that 170 alleged terrorist had been processed by the police in 2016, 33 of whom had been killed. Those killed included four terrorists behind the Sarinah bombings earlier in the year. While terrorists have by and large targeted law enforcement agencies, civilians have increasingly borne the brunt of attacks inspired by the ISIS bombings in Paris. Given lax immigration policies and vague criminal legislation addressing returning fighters, Indonesia has been diligent in initiating a new range of targeted measures. Legally, there has been a move to expand the powers of security forces, allowing them to detain suspects without trial for purposes of investigation, arrest individuals involved in military training overseas, and possibly revoke of citizenship (a direct response to the FTF threat and a step that is currently only practiced in Australia). However, there currently exists no formal program of reintegration and rehabilitation for returning fighters. There are efforts to state a clear re-definition of terrorism that would expand beyond physical acts to include hate speech and symbols. Indonesia already has efforts in place to promote civic education, tolerance, and respect to counter the violent ideology of militancy. Nahdlatul Ulama (NU) and Muhammadiya, the two largest Muslim mass movements, are both based out of Indonesia and have launched programs placing international and reputable Islamic scholars at the center of countering ISIS’s narrative and highlighting the gaps that exist in faulty propaganda. However, more robust efforts harnessed by greater regional coordination must be put into place. Even though public support for ISIS is difficult to find and Indonesia has attracted significant donor funding for its reintegration and rehabilitation efforts, prison reform remains crucial and urgent. ISIS and pro-Jemaah Islamiya arrested ideologues openly recruit in prisons amongst gang members, petty criminals, and disgruntled youth looking for a form of employment, security, adventure, or acceptance into a community. As Liow observes, “corruption, incompetence, poor monitoring, and poor supervision of visits have all contributed to the ease with which radical ideas propounded by jihadi ideologues and recruiters are allowed proliferate among ‘gen pop,’” Poor prison management, over-crowding and lax vigilance allows not only for recruitment and radicalization within cells but also for potential coordination of terrorist activity conducted through social networks and the use of information technology, such as smartphones that inmates can readily access. Indonesia’s de-radicalization program has also seen very limited success. Clerics and former jihadists have both been involved in countering jihadist propaganda and theological teachings but with little success. Countering ideological motivations will have a short shelf-life if they haven’t been the paramount drivers for young recruits in the first place. Sidney Jones, director of the Institute for Policy Analysis and Conflict, notes the urgent need for state authorities to monitor the dozens of convicted terrorists who are released every year to prevent further recruitment for pro-ISIS networks. Released jihadists, with few economic opportunities and limited skills, often return to their jihadi communities, where they are re-exposed to militant ideas. Bilateral, regional, and international cooperation and intelligence sharing is critical to remaining vigilant. Not all incidents can be prevented but Indonesia’s approach has been a combination of tested methods and experimental measures. Utilizing INTERPOL’s database and secure communications network could also help enhance national and regional capacity. While much has been written and argued in favor of countering the narratives and messaging of ISIS in Indonesia, care must be taken to not over-emphasize the approach. While important and legitimate to address these concerns given that the bulk of recruitment is conducted in the social media space, radicalization and recruitment in Indonesia is far more fluid and complicated. Unlike in Malaysia, where the theology of ISIS has been a paramount attraction for young minds, Indonesians are driven extensively by feelings of exclusion, kinship networks, group rivalries, or other financial and practical interests, making the Indonesian recruitment landscape that much more complex to break with any one programmatic approach. Any focus on counter-messaging must aim to target more than just the ideological pull of ISIS. Arsla Jawaid has worked as a journalist and editor in Pakistan. She has consulted for U.S.-based policy institutes on issues of youth radicalization, countering violent extremism, and foreign fighters. She holds an M.A from Columbia University. JI, which remains a potent force, is benefitting from a narrow focus on Islamic State. Is Indonesia Newly Under Attack?Indonesia: Staying Calm and Carrying OnIs Indonesia’s Vaunted Secularism Under Threat?Indonesia, Malaysia and the Fight Against Islamic State InfluenceAre Indonesia and Malaysia Ready to Stand up for China’s Muslims?